ROCKLEDGE, FL, January 31, 2012, Ingrid A. Bimbo, M.Ed., Former Assistant Principal for Chatham Middle School, has been recognized by Elite American Educators for dedication, achievements, and leadership in school administration. Prior to her retirement as an assistant principal, Mrs. Bimbo was responsible for organizing remedial and educational programs at all levels, implementing a safe school program on a secondary level, handling curriculum training, and mentoring and evaluating new and experienced teachers. Over the course of an illustrious career that spanned more than 33 years, Mrs. Bimbo’s professional experiences, her passion for education, and her desire to excel were dominating factors that separated her from her peers; she stood out as an award-winning school administrator as a direct result of her outstanding efforts. In 1994, she received the North Carolina Hospital Association’s Award of Excellence; in 1996, she received an award from the Principal Treatment Center; in 2000, she was honored with the Student Academic Growth and Gain Award by the Governor Morehead School, and in 2008, she received the prestigious Chatham Exemplary Service Award. Although retired, Mrs. Bimbo is interested into going back into a leadership role in education. She believes that every day is a learning experience, and that all students can learn and become productive no matter what situation or experience has prohibited success previously. A positive attitude is the key to success. Living these basic philosophies has kept her passion and spirit alive to become an innovative educator. She had a life-changing experience at her first administrative job as a principal in a locked residential setting for troubled adolescent males. Setting up the program and watching it grow convinced her that all students have a right to an education, and that adults must provide the positive culture, guidance and environment to produce measurable growth and student achievement. Mrs. Bimbo feels that she has clearly made a difference in the lives of the students, which kept her excited about her chosen career path, and she looks forward to serving as a positive agent of change in the lives of more young people in the near future. Ingrid A. Bimbo, M.Ed. was originally selected for inclusion in Elite American Educators in January, 2012. 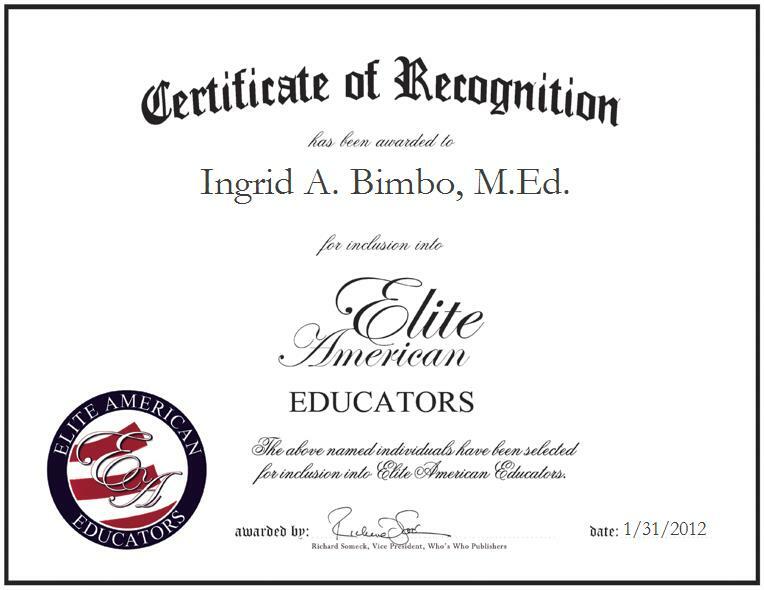 We are proud to be featuring Mrs. Bimbo again in Elite American Educators for 2012/2013.